The classic fruit symbols are back in action, but this time in a much more modern setting. Berryburst is one of NetEnt’s creations and has a fruit/summer theme with the backdrop being set inside an ice-cold drink. Burst the berries along the way and your experience will be much sweeter. This 5-reel new online slot uses the Cluster Pays game engine along with some fantastic in-game bonus features. The Regular Wilds and Expanding Wilds can create some great winning combinations and re-spin opportunities. Enjoy this simple, but enjoyable NetEnt title today. 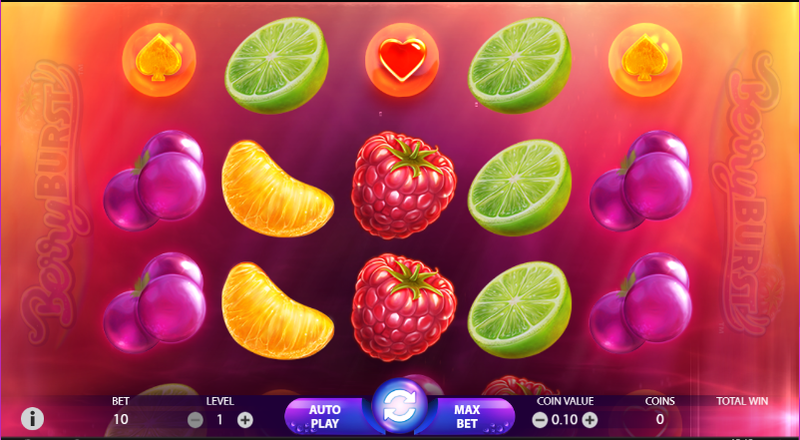 Berryburst’s gameplay is so soothing and is the perfect refreshment for a warm summer’s day. The colourful backdrop gives off the illusion that the gameboard is inside an ice-cold drink and each symbol is a bubble floating to the top. Greeted by energetic music, you’ll have plenty of fun playing on the Cluster Pays game engine. Determining symbol value is very simplistic once you start spinning. The gameboard is filled with low and medium value symbols that will make up your winning combinations. The lowest symbols in value are the pink diamond, orange spade and red heart playing card suits. As for the medium value symbols, you’ll have to discover the lime, berries, orange slices and raspberries. CLUSTER PAYS – A symbol becomes part of a cluster if it is horizontally or vertically adjacent to the same symbol. 5 or more of the same symbols in a cluster awards a win. WILDS – WILDS can appear anywhere on the gameboard throughout the base game and in Re-spins. If one or more WILDS land anywhere on the reels, they will expand to cover the entire reel and will trigger a Re-spin. EXPANDING WILDS – Once the WILDS have expanded to cover the entire reel they landed on, wins are awarded before a Re-spin takes place. The Expanded WILDS will lock in place during the Re-spin. After the Re-spin, any new WILDS that appear on the reels will expand to cover the entire reel. If one or more WILDS land on the reels during Re-spins, you’ll receive an additional Re-spin. If you enjoyed bonuses and extra features check out our S-Baby promotions page! 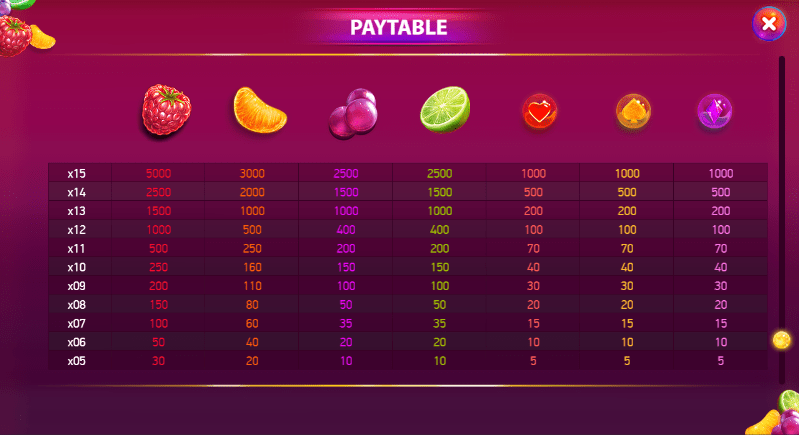 Berryburst is another one of NetEnt’s brilliant Cluster Pays slot. Despite not having a Free Spins Feature, the Wilds and Expanding Wilds can create some huge winning combinations. With so many titles offering adventurous storylines and layered characters, Berryburst is a nice and simple slot with no added complications. Whether you’re a fan of Cluster Pays titles or not, this slot is worth your time. Search S-Baby for more games just like BerryBurst!